"Potato skins are baked until crisp, then filled with chili and cheese and topped with sour cream and chopped green onions." Heat oven to 425 degrees F. Scrub potatoes and dry well. Pierce several times with tip of knife; arrange on large baking sheet. Bake 45 minutes or until tender. Cool. Slice each potato in half; scoop out flesh (reserve for mashing or potato pancakes), leaving 1/4-inch shell. Brush inside and outside of each potato half with oil; season with salt and pepper. 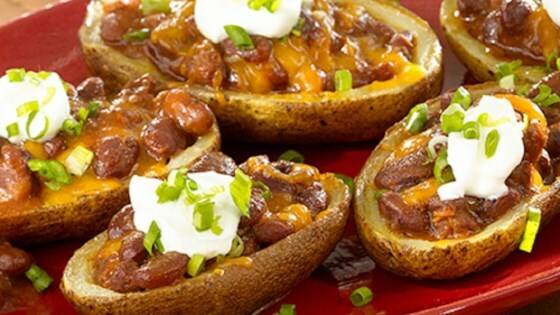 Spoon chili into potato shells; top with cheese. Bake 3 to 5 minutes or until cheese is melted. Top with sour cream and green onions. See how to make crunchy, cheesy, just plain perfect potato skins. It could have used about fifteen or more minutes in the oven before the hollowing process. These were great, just a little bland. My boyfriend doesn't like sour cream so we need something else to spice it up. Made these for my husband cause he loves his chili. Easy to do and he loved them.